When politicians like Ted Cruz copy-paste their prayers into another post-school-shooting press release, they usually fluff it up with a solemn thanks to police and first responders. 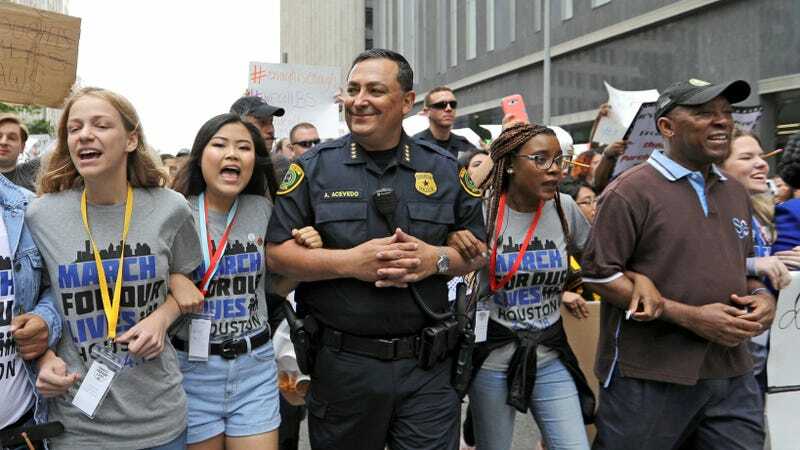 Hours after Houston Police Chief Art Acevedo responded to this week’s school shooting about 30 miles away in Santa Fe, which left ten students and teachers dead, he told them to shove their thanks and do something about gun control. On Friday evening, he posted on Facebook that, after watching children die and “a responding police officer who is clinging to life,” he had “hit rock bottom” with the guns rights debate. “This isn’t a time for prayers, and study and Inaction, it’s a time for prayers, action and the asking of God’s forgiveness for our inaction (especially the elected officials that ran to the cameras today, acted in a solemn manner, called for prayers, and will once again do absolutely nothing),” he wrote. Indeed, the same exhausting thoughts-and-prayers tape rolled again: Donald Trump said he’ll keep weapons out of the wrong hands and then dropped the subject; Ted Cruz sent the same depressing greeting card; Lt. Gov. Dan Patrick literally suggested limiting the number of entries into schools (“door control”). Thanking first responders and police has been added to the standard post-shooting deflection package, and it was, again, added to thoughts and prayers this week.